Remember bell bottoms? If so, good for you. So do I but not because I was old enough to wear them. Thank god or jah or the flying spaghetti monster for that. I was less than 10 in their heyday and they’ve never made a comeback. Nowadays, the only time you see them is in movies that lampoon them or from hearing people looking back and making fun of them. Those wide pants legs that flared as they plunged down toward the ankles were the height of fashion in the early 70s. Even Eric Clapton wrote a song called “Bell Bottom Blues”. Like the song, bell bottom jeans have faded away. 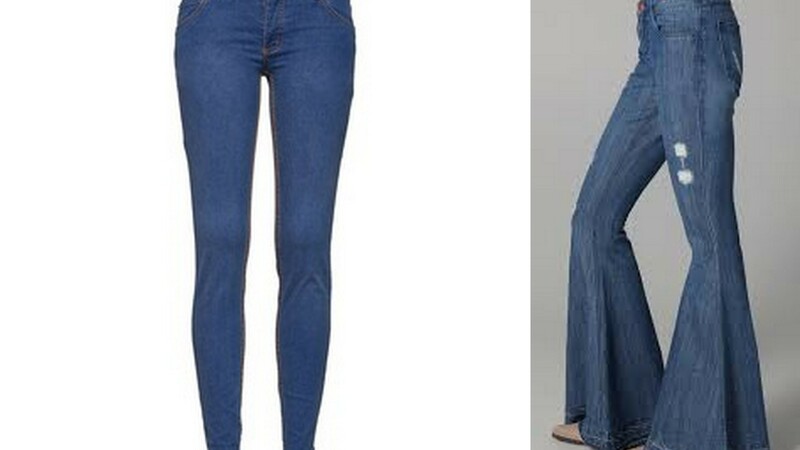 But as tends to be the case, fads follow fads and 40 plus years on, there’s a new style in town when it comes to jeans. This new style is the antithesis of bell bottoms and over the past five or so years, this mode has been squeezing out (pun intended) all other styles, especially for kids. For lack of a better word, I call this new variety of denim funnel jeans. You know the kind I’m talking about. These jeans are already narrow at the thighs and and get even narrower as they taper down to the ankles. They’re almost like tights… or a straight jacket. They get so thin at the ankles that not even my… my… my… –you know where I’m going with this –could fit through. And that is not too brag about girth. It is to point out how ridiculously slim the pants get at the ankles. They make a person look like an arrow, and that arrow is pointing down. In fact, if I was a baker I would use such jeans as an icing bag. It’s like the wearer’s ankles are being choked. Sure, the strangled chicken look might elongate the body, but nobody looks good walking on stilts and that is what comes to mind when I see people wearing these pants. The real frustration is that it is very difficult to find normal cut pants for kids because this trend of pencil jeans has flooded the market. Who would design a clothing style where feet and shoes so obviously protrude at the bottom of one’s clothing? Unless my kid’s name is Excalibur, I don’t want him to look like he is a sword sticking up vertically from a rock. There’s nothing chivalrous about such a look. To put it another way, and quite frankly, I don’t want my sons to look like exclamation points! Full stop.